The adorning Michigan Avenue Bridge celebrated its opening ceremony in the year 1920. This elegant bridge connects Chicago’s north and south zones. Thousands of cars, tourists and pedestrians are passing the bridge every day. 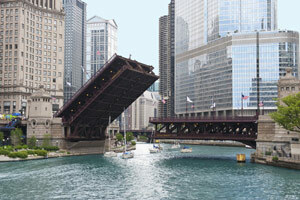 This is the first bascule bridge, with a double-deck, double-leaf ever built in Chicago. This drawbridge is hinged with a counterweight which balances continuously the leaf throughout the whole upward swing provides clearance for boat traffic. The bridge is otherwise called as a Double Bascule Trunnion as it contains two leaves. It owns the pride of an engineering sensation at that time. However, still, engineers have great impression with the mechanical expertise of this centurial bridge. Besides the mechanism, the sculptures on the Michigan Avenue Bridge make the bridge as one of the most popular photographic sights in Chicago. The sculptures represent the main event in the early Chicago history and easily seen while crossing the bridge. 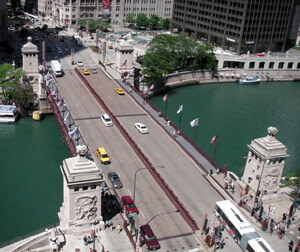 The McCormick Tribune Bridge house & Chicago River Museum were opened in the year 2006 in the southwest tower area of the Michigan Avenue Bridge. This plays displays the history of the river and view of the massive gears of the bridge. 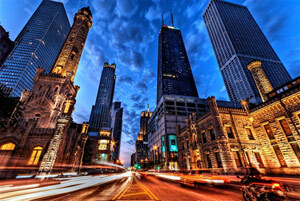 The Magnificent Mile is a place where more than 460 stores located to spend the days just for shopping. It encompasses department stores, luxury boutiques, multi-story malls. Disney, Apple, and Niketown to Bloomingdales and Saks Fifth Avenue are the biggest shopping in the Magnificent Mile. Alongside, 60 hotels, 300 restaurants are here. So, the tourists can enjoy here everything including lip smacking foods. Magnificent Mile lies between Chicago River and Oak Street. Unimaginable bridges and a river walk below the street level provide unique views. The Historic Water Tower, Famous monuments and Pumping station are reflecting the oldest beauty of Chicago. The Old water tower is the oldest building in the Magnificent Mile. It was built in 1869. The castle- like structure looks just a bit away from the modern district. Many times, in 1906, 1918, and 1948 the tower underwent many demolitions. But each time the socialists came forward to preserve the water tower. In 1969 a new building boom work raised. John Hancock Center, a 100-story tall residential skyscraper was built. A tower, at the northern end of the avenue, attracted the large buildings, including the Water Tower Place which encloses more than 100 shops, restaurants, and theatres. At the end of the 1980s, another boom work raised which added a few skyscrapers at the Magnificent Mile such as Park Tower and 900 N. Michigan Avenue. Along the avenue, the fantastic architectural landmarks such as Tribune Tower and John Hancock Center are there.